All of our locations stand out for their relaxed atmosphere and surrounding natural and cultural beauty. Besides offering you a stay in one of our hostels, we can also provide Spanish Language courses, and arrange activities for you. Just let us know what you are looking for. 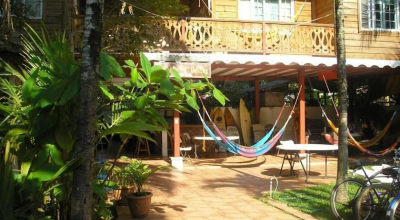 Only 1 block from the seafront in Bocas del Toro, Spanish by the Sea – Bocas features a communal kitchen and dining area, grounds with hammocks and accommodations with free Wi-Fi. The Spanish by the Sea hostel has private rooms and beds in dormitories, all with access to shared bathrooms. A safe is available at the front desk, and the on-site tour desk can arrange kayak rental and provide information about things to do in Bocas del Toro. You can swim and snorkel within a 5-minute walk of Spanish by the Sea, and surfing classes are available just a 5-minute boat ride away. Bocas del Toro Airport is just over half a kilometer away, and is a 1-hour flight from Panama City. This is our guests' favorite part of Bocas Town, according to independent reviews. This property is also rated for the best value in Bocas Town! Guests are getting more for their money when compared to other properties in this city. Spanish by the River – Boquete is a colourful hostel located in Alto Boquete Town Centre that offers free Wi-Fi, free parking and on-site cooking and dancing classes. This property has bright dormitory rooms with garden views, tiled floors and shared bathrooms. It also offers private rooms. Breakfast is served every day at Spanish by the River – Boquete, and lunch and dinner options can be found within 100 m. The property also offers a fully equipped kitchen for guests who want to cook at home. Activities like hiking, zip lining and white-water rafting can be arranged by the property, with Baru Volcano located just a 15-minute drive away. David City Centre is a 45-minute drive away, while Enrique Malek International Airport is a 1-hour drive away. This property is also rated for the best value in Boquete! Guests are getting more for their money when compared to other properties in this city. This tropical hostel is located within a 5-minute drive of Turrialba Town Centre and features free Wi-Fi and free on-site parking. It also boasts a shared kitchen and a terrace with hammocks. Spanish by the River offers rooms with wooden décor, garden views and tiled floors. They all come with a shared bathroom with a shower and toilet. The property offers daily traditional breakfast and free coffee and tea in the mornings. Guests will find restaurants in Turrialba Town Centre, many of which deliver to the hostel. The tour desk at Spanish by the River can arrange activities like whitewater rafting, horse riding, nature outings and canyon tours. The property also offers a lounge with computers and televisions. Guests can reach Irazu Volcano in a 1-hour drive, while Juan Santamaria International is 65 km from the property. 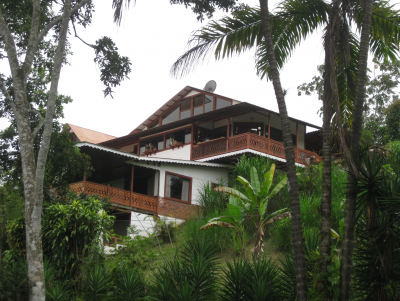 This property is also rated for the best value in Turrialba! Guests are getting more for their money when compared to other properties in this city.